Over the last few weeks we’ve been updating our reviews and comparison charts with the best selling* thermostats among Smart Thermostat Guide visitors. Unsurprisingly, the very popular ecobee3 (our review) dominates this list in both its 1-sensor and 3-sensor pack versions, but the much older Honeywell WiFi Smart Thermostat (our review) puts up a good fight, along with several other budget-friendly and feature-heavy Honeywell offerings. Honeywell’s newest smart thermostat, the Lyric, doesn’t even show up in this top 8 list – not surprising, considering the Lyric’s post-launch struggles and rather negative reviews. 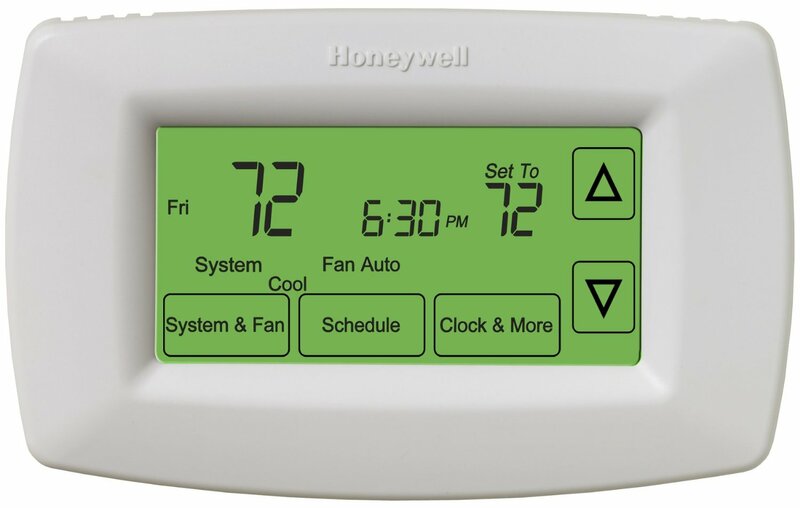 The humble but popular Honeywell RTH7600D is the only non-WiFi thermostat in our top 8. Somewhat surprising, though, is the sheer number of thermostats in this list that don’t look at first glance like a “smart” thermostat – they may lack a color touch screen or use a humble grey/white body design, even though many are WiFi-enabled. Honeywell excels in this category, adding WiFi to its well-regarded programmable thermostat designs while holding back on the extra bells and whistles. Below are the top 8 best-selling smart thermostats according to STG.com visitors. *This list was compiled by analyzing what our readers are buying on Amazon.com once visiting Amazon through our affiliate links. Read our full disclosure policy here. I own a ecobee3, I also owned the previous ecobee smart thermostat. These are not just a programmable thermostat. This device helps make you house as comfortable as can be with it’s remote sensors. Ecobee3 is #1 for a reason. Until the competition offers the remote sensor capabilities as well as the incredible resource of Home IQ there is no point in considering any others. As an owner of the first the Ecobee Smart SI thermostats, and now an Ecobee 3, I can definitely say I am extremely happy with my choice. The ability of the ecobee 3 to be able to measure the temperature in multiple rooms is a killer feature that pretty much makes all of the other thermostats obsolete. My office with two hot running computers has never felt better. I went with Ecobee because of the remote sensors and great UI on the thermostat’s touchscreen. Ecobee 3 is by far the best thermostat available. The remote sensors can’t be beat! I got my Ecobee 3 about a month ago. Averaging temperatures between the sensors has really helped the comfort in my bedrooms. I also really like all the data Ecobee makes available to me on their website. I bought the ecobee3 mainly for the remote access, smart humidifier control, and the remote sensors. I love that I can control my thermostat from anywhere and easily change the schedule (including adding a scheduled vacation) from my phone. I also like the remote sensor, so I can make sure the temperature is correct where I want it (e.g. a bedroom), not just based on the location of the thermostat (the hallway). The web interface with the HomeIQ statistics is really nice, too! Hello, if one wants to push further the automation of her/his home, then a smart hub is required. One of the leaders on the market is SmartThings (see http://www.smartthings.com). 1) Lower your ecobee thermostat settings automatically & right away when no one is at home (based on presence sensors such as iPhone, Android phones, zigbee tokens for your kids). 5) Security And Safety workflows: if a smoke detectors triggers, unlock the doors, turn on the lights (at night or flash them during the day), turn off the thermostat & alarm system. Do the opposite (if needed) when it’s clear. And so on…Your imagination can do the rest. The possibilities are (almost) endless. Have to agree with ecobee3 being #1. The remote sensors are brilliant so nothing else can even compete at this point. EcoBee3 is a dominant product. The remote sensor capability and great customer service raise it heads above its competitors. Not surprised – the results are accurate. Ecobee3 is far and away #1. I like the Ecobee thermostats because you can control them from anywhere. I installed an Ecobee just a little while ago and it’s fantastic. I now have 3 remote sensors placed in some key rooms in the house and it is do a brilliant job of moderating the house temperature. Their mobile app is also very well done. If you’re looking for a new smart thermostat, I recommend the Ecobee 3. I love my Ecobee 3. I have tried every thermostat out there, but this is the one im sticking to. They are going to take over the market with their amazing products! I’ve had the ecobee 3 all winter and the cost savings were noticeable! It also gives reports on the website. Very pleased with my purchase! I own one, considered the NEST and Honeywell. Very pleased with the Eccobee3 after three months of ownership. I don’t believe they are finished improving this product and am looking forward to how they improve on an already excellent product. Ecobee 3 has features that no other smart thermostat has. The remote sensors are by far the most obvious feature that no other smart thermostat can compete with. I spent a few months reviewing Honeywell, Nest and Ecobee. In the end I chose Ecobee3 and haven’t been disappointed. After much evaluation, I went with Ecobee 3 for each of my house’s 3 thermostats. The features & integration were awesome… very happy with the decision! The Ecobee 3 with the remote sensors works great! The best home investment we’ve made. Unlike other smart thermostats that aren’t smart enough to really keep you comfortable, the ecobee3 with remote sensors actually provides the information and the control needed to truly customize comfort at the individual level. Just look at the thug. It’s gorgeous! You can’t go wrong with multiple sensors and customizable actions. Recently moved in to a new house and wanted to start with one of these wi-fi enabled smart thermostats. After a couple weeks of research and reading we chose the Ecobee3 over Nest and Lyric. Lyric was never really in the running based on reviews and problems it was having, so it came down to Next and Ecobee3. In the end that was an easy decision as well. For basically the same price the Ecobee gives you the ability to monitor other rooms and add them into the settings instead of a single location with Nest. Ecobee also provides detailed videos for installs and settings so I knew in advance this would be easy to install and set up. Extremely happy with the Ecobee3!! Ecobee 3 is the best thermostat I’ve seen! My Ecobee3 allows me to set a simple schedule that maximizes the time the thermostat is set back, but still automatically adjust when we’re home or away contrary to the schedule. I am satisfied that I chose ecobee3 over nest as my choice for a smart thermostat. I’ve been an ecobee user since practically day one when they were the only real player in the WiFi smart thermostat game. I’ve seen both the company and products evolve to the industry leader that they are today. No other manufacturer has the experience that ecobee does in this market, and it shows. Sure, over the years, I’ve looked at the other products on the market, just like anybody looks at what’s available in the new car market from time to time, but the features, reliability and continuous refinement of a rock solid platform are what keep me as an ecobee customer. Ecobee3 is great, the customization alone is awesome! The cherry on top is the fact you get a room sensor to boot. NEST wants you to drop another $300 on a third party provider. More bang for your buck, and a more comfortable home with Ecobee3. I have had a Nest and and Ecobee3 and the Ecobee3 with the remote sensors sets it apart from all other thermostats. Ecobee is the best out there, tried all the others, none with as much control as this one. I looked high and low for the right Smart Thermostat and the Ecobee3 was the smart man’s thermostat while the Nest was the everymans’ thermostat. I mean no insult but the Nest was made to sell in large quantities and with major financial backing. The Ecobee3 is much more well thought out, intuitive, and overall a better choice for the same money. I was looking toward the NEST but ended up with the Ecobee3. The specs are better, it is more configurable and still easy to use. Ecobee is really more sophisticated than the Nest. Got 2 of them and love them. For a home that’s large and has multiple temperature changes, the ecobee 3 with it’s sensors makes it the only option for a truly smart home. Ecobee3 is the best out there right now. The remote sensors (additional cost) makes it flexible and easy to set up for full automation. I enjoy my ecobee3 a lot. It keeps my house at a average temp. And only heats when someone is home. Great buy. I got the ecobee3 because I didn’t want a device to had to learn my habits, I wanted to set a schedule and have a very modern looking device. Win win. Why haven’t you posted my review from March 2nd? I thought it might just have been in a backlog of comments awaiting moderation, but I see a comment from March 5th that managed to make it through. Are you cherry-picking the comments you want to publish? You have to get one of these amazing thermostats! They make our home so much more comfortable! Ecobee3 is hands-down the best. I must agree with the comments about the sensors for the ecobee3. My main thermostat is in a colder area of the house that it controls. The rooms are usually 3-5 degrees F warmer in the winter. With the Ecobee 3, I can exclude the temp reading on the main thermostat and just use the remote sensors in those room to calculate the proper temp. That is a really nice thing! best purchase i made this last year love being able to look at thermostat from work and also love the sensors for motion detection. Very happy with my move from Nest to Ecobee. I liked the savings my first ecobee3 earned me that I went ahead and bought a second one. It pays for itself in about a month and a half of use in my case. I have owned Nest, Lyric and now ecobee. The ecobee is the winner for our family hands down! With full disclosure of the logic in the web app and the remote sensors, you can fine-tune the stat settings to achieve the most energy efficiency without sacrificing comfort. Ecobee is head and shoulders above everything else out there. If they would just fix the humidity frost control algorithms it would be a great product! Since day 1 of installing our ecobee3 our house has already eliminated uneven temperatures in the house! It’s great, intuitive and works to our family’s needs. I’ve had the Ecobee3 for 4 months now it has lived up to all expectations. What I wasn’t expecting was how outstanding the community is as well. There is a reason its first on the list. Still very happy with my old ecobee Smart Thermostat. Would love the ecobee3, but really no need to spend $ to upgrade….yet. It’s nice to see others agree with my decision to purchase an ecobee. We did a lot of research before choosing Ecobee3 to replace our programmable Honeywell. The main reason we decided to use a smart thermostat was to shut down the heat pump (outdoors) when it was just too cold for it to be of any use in providing heat and to allow just the auxiliary heat to run. After many super cold nights in the east coast this winter, it just doesn’t make sense to have both units running and wasting electricity. In fact, our condenser grounded out and we had to replace it. The HVAC company said it was very expensive to install a switching sensor system. Ah! Ecobee3 to the rescue: just set your outdoor temp to the minimum before it shuts down and then the aux heat will kick in. We also love all the other wonderful features of it as well like “smart recovery” and “smart away”. I am a tech geek that owns a HVAC company and the Ecobee is the best WiFi thermostat we have to offer and recommend it the most often. I had purchased the Nest originally until i heard about all the features of the Ecobee, the fact that you can have remote sensors where you want them is a plus for me. It keeps track of humidity, can control accessories. tell me the current temp outside, inside. And also can keep track of all its activity through the website. pretty awesome gadget. Not only does the ecobee3 integrate my heat pump with my oil burner, but it gives me instant weather reports when I need them. It uses the outside temperature to use both systems efficiently. I picked ecobee 3 because of its remote sensor and its smart features. Best purchase ever! I had the Honeywell non-wifi option and it’s a really good non-connected thermostat. But, when I decided to connect/automate my thermostat (after having done so with lights, locks, garage door openers, motion sensors, etc. ), I went with ecobee3. I’m incredibly happy with that decision. Ecobee 3 is the best thermostat I have installed and easy to setup. Lots more control and ease access from your Android phone. Our family doesn’t really have too regular of a schedule to be ‘learned.’ My wife works at home in addition to taking the kids to and from school / preschool on certain, but not all, days of the week. Also, we had pockets of the house that were hot / cold relative to other areas in the same zone (and not correctable with dampers). So, while I was originally interested in the nest, after some research, I determined it was not for us and waited for the next best thing. So, for us, we really like the ability to set the general schedule by time of day and have our Ecobee3 adapt Home/Away settings based on when we are actually there or actually gone using the remote sensors which pick up movement throughout the house and not just in the 2 locations where the thermostats happen to be. Moreover, the remote sensors really help ensure where we are at any given time is the most comfortable place in the house at the setting we intended for that time of day! Can’t be happier with our Ecobee3. This is a very feature rich smart thermostat and it just keeps getting better. The remote sensors put it in another class compared to Nest! Ecobee3 is perfect. Very easy to self install, flexible and fun. I manage both of my systems with the mobile application. The kids love the ability to see the current weather and the forecast from the thermostat. I like the ecobee3 and appreciate that no longer is my house limited to the temperature that it is within a few feet of the thermostat. The bedrooms upstairs are no longer 10degrees warmer than comfortable when we are there. The whole house feels a more uniform temperature with the furnace fan kicking on a few times an hour to mix the air from various spots in the house. After a lot of research between the “other one” and then seeing the advantages it had over this one, I gave it a go. So far I have been extremely impressed! The setup and configuration couldn’t be simpler and the interface is easy on the eyes. It’s handsome display helps you find everything you need and gives information within the context of what you’re changing to know what you’re actually changing. So far, we’ve set it up for our Spring to Summer months here in Florida and have already seen the savings. My favorite feature so far is being able to run the fan at certain intervals to allow for recirculating the existing cool/warm air in the home. This cuts down on using the compressor or furnace all the time. I also enjoy the AC Overcool function to eliminate humidity in the home whenever it detects it at a higher percentage than my preferred value. The sensors are what sold me. I love being able to use them to my advantage by having them calculate an average overall temperature in the home, but also giving me the option to use them as I enter the room and make it comfortable if I choose while I’m in there. IFTTT integration has been a fun option as of late. I’ve been able to tie it to my alarm system so when I activate or deactivate my alarm, the thermostat will be in Home or Away status, respectively. The ultimate part of the thermostat is its endless configuration and the incredible work they are doing on the HomeIQ page. This particular website login page allows you to fully see in many ways how your thermostat is functioning against the desired temperatures, outdoor temperatures, scheduled temperatures, and humidity. They have recently upgraded it to give more data and feedback on how your utilization compares to others. Along the same lines, the app on the phone mirrors that of the actual thermostat is awesome in changing settings on-the-fly. This was probably the best investment we made in our already energy efficient home. I just wanted to turn it up a notch and save more money during our relatively bad months of high heat and humidity. In fact, if we can save the compressor from turning on constantly we may actually also save the life of it in the years to come. Better for the environment, better for our wallets, better for those of us in the BeeHive. I own an ecobee3, and have been extremely impressed with not only the product itself, but with the entire ecobee organization. They have reached out to me for feedback and seem to genuinely appreciate my opinions. Count me as a new lifelong customer. ecobee 3 is great. The remote sensors make my overall HVAC system run better with less short cycles caused by rapid temperature changes in the room with the thermostat. I purchased the Ecobee3 because I have a large house with 4 HVAC zones. The only smarthern option that could work well with a home like mine is one that would have remote sensors. So far so good! I have had an ecobee3 installed… it rocks. Best use of $250 dollars in past 12 months. The remote sensors that are a feature of the ecobee3 are really a game changer! I narrowed my search down to Ecobee, Nest, and Honeywell. On paper, they all looked good. I decided to test the customer support of all three with a question about compatibility with my existing system. It wasn’t even close. Ecobee responded fast, friendly, and with helpful information. One of the above never even responded. Everyone is happy when all is well. I needed to know I would still be happy if any problems arose. Therefore, Ecobee3 is now on my wall. I’m excited to see whats next with the Ecobee and other wifi thermostats. I researched smart thermostats for weeks before choosing the Ecobee 3. I was leaning heavily towards the Nest until some relatively deep digging started to point out it’s shortcomings and flaws. While the Ecobee 3 isn’t perfect by any means, it is well supported, updated regularly incorporating user feedback and has an awesome community to share ideas and learn from. Nice post. From I bought a wifi thermostat I have saved near to $300 yearly. Are there any smart thermostats that would help me keep track of how much oil I have left in the tank? Or at least report how much has been burned? Based on reviewes, I do not believe that the ecobee 3 lite thermostat comes with Geofencing. It would make it even better if it did.